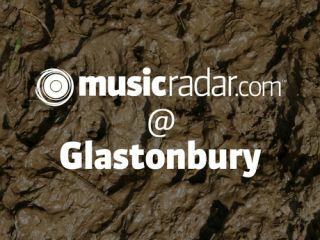 Sadly, this weekend saw MusicRadar besieged by technical difficulties when uploading our 'in the trenches' report to the site. Massively frustrating for both us and (hopefully) you - our apologies but, as the cliche goes, matters beyond our control. Next page: enough moaning, to The Cider Bus with us! Who cares about The Dead Weather? Jack and Meg's new image got an exclusive preview in the Green Fields. Maccabees groupies with their ears to the hallowed Glastonbury ground made their way to a tiny tent stage on Saturday morning for this low key performance. No set list - fans were invited to say/shout/scream the tracks they wanted to hear. Although it's undoubtedly the best bit, music isn't the only thing on offer at Glasto. The fields surrounding the main stages are full of circus performers, healers, comedians and, as this shows, some rather talented sprog artists. One of the many 'out there areas' at Glastonbury, Trash City is "an apocalyptic dream-world straight from the pages of a 2000AD comic, where space pirates, bootleggers, illegal aliens and all the scum of the universe can come and party the night away…". They don't write press releases like that every day. The stars of the music world were out in force this year. Sadly, so was this bloke. Finally, another photo of an actual band! In a 'challenging' bit of planning, US indie darlings Cold War Kids played right before one of Sunday's main attractions (Blur) on a stage (Park) that couldn't be further away. Still a decent crowd, it must be said. Glasvegas light up the Other Stage like a beacon of Scottish hope. Quick plug: MusicRadar caught up with lead singer James Allan in December last year. With the sun setting, the race was on to make it to Blur. I mean, seriously, get THE HELL out of the way. Our brief stop at Glasvegas meant we arrived late for Blur's return to Glasto. This was the best view we could get initially. After much apologising, shoving, and stepping on people's wellies, we managed to get a lot closer. THIS IS WHAT IT'S LIKE ALL THE TIME. Anyone who say Glasto on telly will have seen the floating lanterns that Damon liked so much. This fella is the last of them. Sniff. And that's yer lot. After sitting in traffic for five hours yesterday (and that's before leaving the car park), I was not only late as hell but so hygienically-challenged that I wasn't safe to come within five feet of anyone without a HazMat suit (they only let me back in the office this morning). Thanks for watching (despite the - ahem - communication breakdown) and remember to check out all the best bits, photo galleries and classic performances from Glasto 2009 right here if you missed it. See you next year! Jon Sherrard.